The tale is told by a grandfather to his grandson, both named Mateo - Teo. Chapters alternate between the two but for most of the book the modern chapters are very short and the main part of the story is that of the Grandfather's youth, living in a little village in Mexico called Hill of Dust, where his own grandfather is the healer. Teo's sister was drowned the previous year and his mother is lost in her grief. Teo has a role as translator and assistant to the grandfather, and also has a special talent for rescuing animals which plays a part in the story from beginning to end. Every year travelling gypsies visit, bringing movies to show and telling fortunes for the locals who pay with crafts and food. 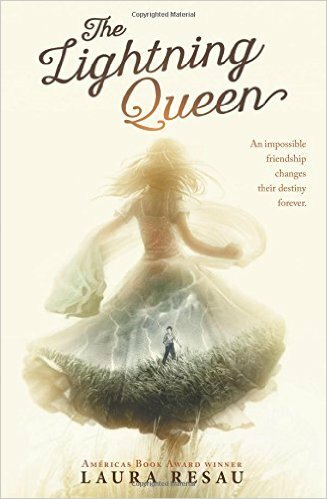 The Lightning Queen of the title is Esma, a vibrant young gypsy girl called Esma who explains her limp and deformed hand by saying she was struck by lightning. She captures Teo's heart from the begninning and when his fortune is told it is predicted that they will be friends their whole lives. There are many problems for both children, each culture - Romani and Mixteco, have their own rules about how they should behave and they have to find clever ways to work around it. Esma has an amazing life force and determination that she is going to have a special life and achieve her true fortune - to be a famous singer. Teo finds the strength to do many things he would not have done without Esma's urging, like going to school to learn to read (their combined actions to get the cruel teacher on their side is fabulous). I don't want to reveal more of what happens in the story, you should read this magical, mystical tale for yourself. I learned much about both cultures and about having determination to change your own life, and accepting those around you as they are. A great read for 8+, and definitely for adult readers too. You can check out the author's website here.